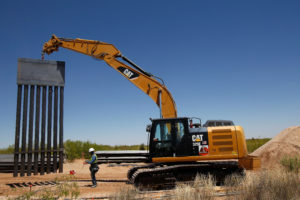 WASHINGTON — Three confidantes of President Donald Trump, including his departing chief of staff, are indicating that the president’s signature campaign pledge to build a wall along the U.S.-Mexico border would not be fulfilled as advertised. READ MORE: What’s the status of Trump’s U.S.-Mexico border wall? After canceling a vacation to his private Florida club, Trump spent the weekend at the White House. He has remained out of the public eye since returning early Thursday from a 29-hour trip to visit U.S. troops in Iraq, instead taking to Twitter to attack Democrats. He also moved to defend himself from criticism that he couldn’t deliver on the wall while the GOP controlled both the House and Senate. What’s the status of Trump’s U.S.-Mexico border wall?